Hubble calibration files and calibration program data are now available for download through the MAST Data Discovery Portal. The MAST Portal is now providing delivery of calibration data for Hubble Space Telescope (HST) instruments. This includes calibration files (bias, dark, and flat frames), as well as data from HST calibration programs, such as observations of standard stars for flux calibration or dispersion solutions. Figure 1: A MAST Portal advanced search set to show calibration data for the ACS/WFC instrument on HST. Figure 2: Available 'Calibration Level' filters. 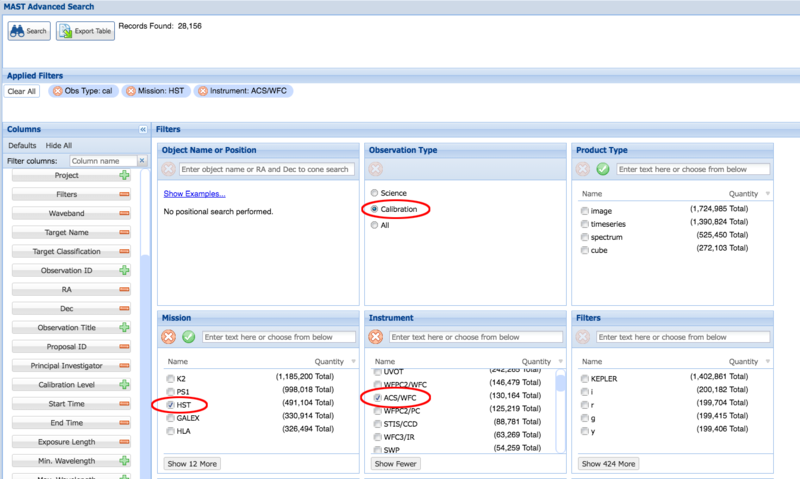 Calibration data can be retrieved using the Advanced Search functionality in the Portal. 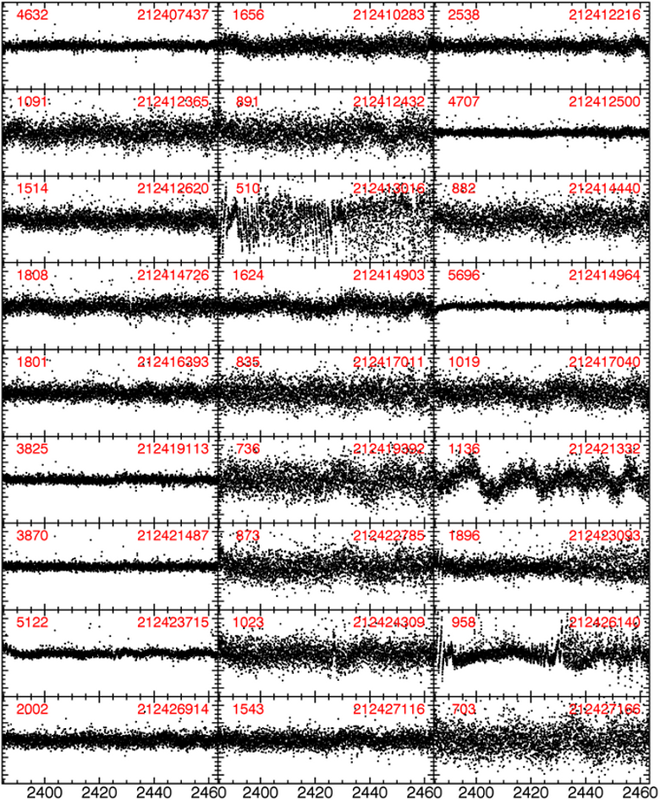 As an example, Figure 1 shows how to select calibration data for the ACS/WFC instrument on HST. After making these selections and hitting the “Search” button, the main Portal grid shows a list of calibration observations. Further filtering for bias or dark frames can be done using the “Calibration Level” selector on the left-hand side of the display (choose 1 and/or 2; see Figure 2). 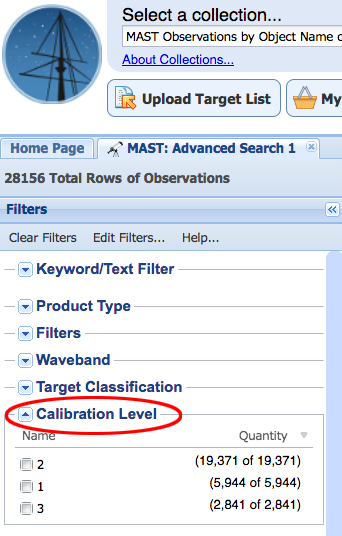 Filtering for calibration program data can be done by selecting Calibration Level = 3. Additional questions about retrieving calibration data through the MAST Portal can be directed to the Archive Helpdesk at archive@stsci.edu. This feature allows users to review and re-download previously-accessed data without the need to perform another query. Version 3.3 of the MAST Data Discovery Portal includes a new 'Download History' feature within the download manager. Users who are logged in with a MyST account will be able to select the 'Display Download History' button in the Portal header (see below) to launch a Download Manager window with previous data downloads listed by date. In this window, users will be able to see details of data accessed previously, filter history results for various Portal parameters, and re-download data without the need to perform another query. 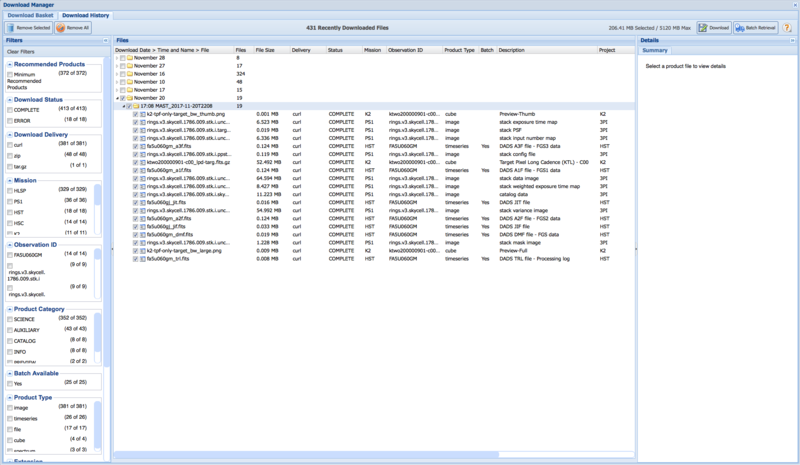 The download history feature is also available to anonymous users, though the history is limited to data downloaded during the current session. Additional questions or comments on this new feature may be sent to archive@stsci.edu. Example of Download History results. New HLSP material includes extragalactic targets from K2, simulations of strongly-lensing galaxy clusters, high-metallicity stellar atmosphere models, and HST observations of Neptune. November saw the release of one new High-Level Science Product (HLSP) and updates to three existing products. The newest HLSP is the Kepler Extra-Galactic Survey (“KEGS”, Shaya et al. ), which provides detrended light curves of extragalactic targets observed during the K2 mission. The team uses custom co-trending basis vectors (CBVs) to remove spacecraft systematics while preserving intrinsic variability. The CBV solutions for supernovae are obtained by only analyzing the light curves before and after the events. In addition to the detrended light curves, the KEGS team provides the CBV solutions themselves for each Campaign, and a variety of diagnostic plots. Each target gets multiple detrended light curve preview plots using differing numbers of CBVs. The team also provides diagnostic plots showing all extragalactic targets for a given K2 channel, like the one shown to the right, which allows for visual checking of variability shared between multiple targets: often a sign of residual systematics. A pair of simulation projects received updates over the past month. The Frontier Fields Lens Models received “version 4” and/or “version 4.1” models of the Abell S1063 and Abell 370 clusters from the Sharon, Keeton, Williams, Diego, and CATS groups, while “version 4” models from the GLAFIC group were added for the Abell 2744, Abell 370, Abell S1063, and MACS 0416 clusters. The BOSZ Model Stellar Atmospheres were updated with a high metallicity set at [M/H] = +0.75, across the range of temperatures, gravities, abundances, and spectral resolutions already available. The Outer Planet Atmospheres Legacy (OPAL, Simon et al.) released its next set of observational data: HST observations of Neptune from Cycle 24. The data release includes global maps from two rotations in seven different filters, plus three-color images. Fans of OPAL should stay tuned, as Uranus Cycle 25 data will be released shortly as well, so as always, check the MAST What’s New feed on our website, or follow us on Twitter (@MAST_News). This newsletter is a MAST publication produced by Jonathan Hargis, Peter Forshay, and Randy Thompson, on behalf of the entire MAST staff, who welcome your comments and suggestions. The Mikulski Archive for Space Telescopes (MAST) is a NASA funded project to support and provide to the astronomical community a variety of astronomical data archives, with the primary focus on scientifically related data sets in the optical, ultraviolet, and near-infrared parts of the spectrum. MAST is located at the Space Telescope Science Institute (STScI).